» Science under siege – the (deliberate?) hijacking of real science by alternative medicine. Recently I was invited to speak at a forum organised by the Royal Zoological Society of New South Wales on the topic of “Science under Siege”. It turned out to be a fascinating day, with a dozen or so talks covering all manner of topics from the old nut of difficulty getting funding to poor reporting of science by the mass media, the extreme behaviour of some animal activists, and the lack of public understanding of science/the scientific method leading to a public perception of scientists as elitist, stuffy, stuck-up boffins. Held at the beautiful Taronga Zoo here in Sydney, it was great to present at this wonderful institution in such a lovely setting with sweeping views over Sydney Harbour and squirrel monkeys leaping around outside the conference centre windows. So let’s get straight into it..
“…eczema, psoriasis, irritable bowel syndrome, asthma, headaches, sinuses, rashes, indigestion, pre-menstrual tension, chronic fatigue syndrome, candida (thrush), ADHD/ADD, flatulence and constipation, diarrhea, fatigue, mucous, arthritis, acne, tonsilitis, AIDS, cancer, restless leg syndrome, sleep disorders, etc”. For just AUD195 (affordable?? ), a sample of your hair is placed in a beaker which is then slotted into a machine, and with the assistance of a ND (Not a Doctor, or Naturopath Doctor), lights flash, dials flicker and out pops a randomly generated list of foods you are allergic too. This machine is so sensitive it can even detect allergies within food groups (e.g., you can’t eat peanuts, but walnuts are okay), and also identify allergies to specific brands of compounds (eg., washing powders). Consequently you are advised to follow their diet for a designated period of time, sometimes they recommend you take their supplements as well, and generally you are required to return for a follow up visit months later to determine whether you are “cured”. So, just what is behind such advanced and sensitive technology? Glad you asked people, it’s quantum. At least, this is what I was told by the lady taking the cash. So, here’s the first example of the hijacking of scientific terminology by quacks, applying the concept of quantum technology to a procedure that is obviously just flashing lights and flickering dials. I wish I had been able to take a photo of this super special quantum machine, since apparently it has been developed over 20 years by a ND. To me it looked pretty old school and antiquated; not something I would expect for a “quantum machine” but then what would I know, I’m just a scientist..
Williams, C. The Skeptic, 2003; 23(2): 35. Properly conducted scientific tests of identical samples should NOT yield results that are statistically different from each other, otherwise there is something wrong with your protocol. This is why when we conduct tests, we run multiple replicates on the same sample AND we also replicate the original sample. This allows for some biological variability, but importantly controls for the reliability of the experimental protocol. As you can clearly see, the results were vastly different, despite the samples being from the same person. This does not instill me with much faith with respect to the stringency of their scientific method. Which is why I affectionately call their “quantum” machine a “randomly-generating-allergy-machine”. But in fact, hair analysis is a legitimate scientific technique and is currently being used by a colleague as a method for measuring levels of a toxic amino acid which causes a motor neurone disease similar to Parkinson’s, Alzheimer’s and ALS (amyotrophic lateral sclerosis or Lou Gehrig’s disease). In a fascinating example of good scientific detective work, Dr Paul A Cox and co-workers observed a 50 – 100 times greater incidence of this disease amongst the indigenous people of Guam, the Chamorros. BMAA (Beta-N-methylamino-L-alanine) occurs naturally in the seeds of the cycad tree, but not in high enough concentrations to have neurotoxic effects. However, similar to the way mercury and other heavy metals “build-up” in the flesh of fish, BMAA concentrates via a process known as bio-magnification. Fruit bats also feed on cycad seeds and coconut bat soup is a delicacy amongst the Chamorro people. And accessibility to fruit bats was made easier after WWII when the Chamorro’s gained access to shotguns, thereby increasing their consumption, so much so that they put one species into extinction and another on the endangered species list. As a method for identifying patients at risk of contracting this PD/ALS-like disease, Dr Cox breaks the bonds between the amino acids of keratin, the major protein component of hair, and uses high end mass spectrometry and gas chromatography to measure levels of BMAA. A cute fruit bat, not so cute anymore.. Subsequently, BMAA has been found across the developed world too. A paper published in 2008 in Environmental Microbiology (Metcalf et al., 10(3); pg 702) created quite a stir when these researchers reported toxic levels in some drinking water reservoirs across Britain. The source of this contamination is cyanobacteria, also known as common blue/green algae blooms which appear sporadically in water reservoirs exposed to light and heat (cyanobacteria need sunlight). • The treatment claims to be effective against a very wide range of ailments. • There is no scientific evidence to back up the claim that the miracle cure actually works. • Miracle cures usually include anonymous testimonials, for example ‘Luke, from Melbourne…’. Check out their website for further information. It makes me wonder how the likes of these quacks get away with this nonsense. As someone remarked during my live podcast about this topic, why are these people not locked up? This is a legitimate question. The Australian government and it’s regulatory body the TGA have a lot to answer for if they are not protecting the public from quacks and scams like hair analysis. Dr Rachael A Dunlop has a PhD from the University of Sydney, Department of Medicine, in Cell Biology. She currently works full-time in medical research. Contact me at rachael(at)skepticzone.tv. Richard Saunders also contributed to this presentation. Footnote: Hair analysis as I have described here is not the same as DNA analysis from hair the like of which you may see on television, ala CSI etc. This describes the extraction of DNA from hair as a method for identifying a criminal etc which requires the amplification of a very small amount of DNA via PCR (polymerase chain reaction) to gain a DNA match. Thanks Ma for bringing this to my attention, I will endeavour to address this in the coming episodes of Dr Rachie Reports. Further reading: (1) Banack SA, Cox PA. Biomagnification of cycad neurotoxins in flying foxes: implications for ALS-PDC in Guam. Neurology (2003): Aug 12;61(3):387-9. (2) Cox PA, Sacks OW. Cycad neurotoxins, consumption of flying foxes, and ALS-PDC disease in Guam. Neurology (2002): Mar 26;58(6):956-9. 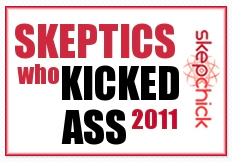 « The Skeptic Zone hits number 1 on iTunes Australia, outranking Oprah and SGU!? » When ignorance is not bliss and alternative medicine just won’t quit.